Supporting our Neighbor our Brother and our Friend Corporal Seth Kelly. On Tuesday morning November 7th our Neighbor, our Brother and our friend Corporal Seth Kelly was critically wounded in an horrific situation on Rout 33 in Plainfield Township. Most firefighters of Upper Nazareth Fire know the Kellys, Seth and Philomena, many times they walk hand in hand across our parking lot stopping to chat with us as they take an evening stroll. We at Upper Nazareth are sending thoughts and prayers to the Kellys, and for a speedy and full recovery to Seth. Prayers to the Kelly Family. Corporal Kelly you got this! Prayers for speedy and full recovery! Sending prayers and love to you all. God Bless. 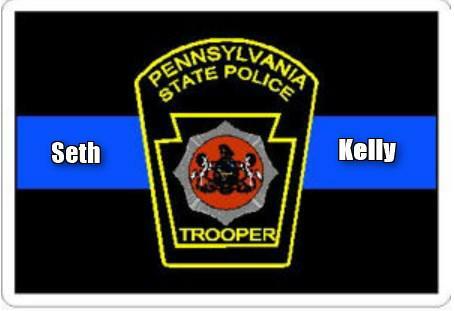 Our hearts and prayers are with Trooper Kelly and his wife and his police family as well. We are fully committed to assist all officers and continue to pray for Trooper Seiple as well. Humble Hearts For Hope www.hhfh.org has started a new program "Bless The Blue" in response to this weeks incident. Continued prayers for all involved and for our officers and troops safety.